Today we learned the session has been extended for one week, through May 8, to deal with budget issues only. House Speaker Larry Cretul and Senate President Jeff Atwater announced earlier that the framework for the budget has been worked out, which means conference committees can begin meeting this afternoon, with discussions expected to continue through Friday. The schedule has budget chairs meeting through the weekend, with the budget printing on Monday and being submitted to legislators by Tuesday. After the required 72-hour cooling-off period, a final vote on an agreed-upon budget is expected by next Friday, May 8. As the End Draws Near...Or Does It? As we plan for what we hope will be the last week of the 2009 legislative session, we are all waiting to see whether or not the budget is finished by Tuesday. If not, legislators will have to either extend the session, or go home and come back, before the June 20, 2009 expiration of the current budget. Unfortunately, taxpayers pay the price if session is extended or a special session is convened at a cost of $40,000 per day. Meanwhile, a limited number bills are moving in either chamber. As we've been reporting, a health care train that contains the Agency for Health Care Administration's regulatory bill along with a Medicaid fraud bill now includes language on a new way to provide home care through the state's medical schools. Could this be another attempt at Medicaid reform? Last week, the nursing home therapeutic formulary bill we've been monitoring was amended to include so many requirements that it has been removed from the pharmacy bill. In other news, the controversial election bills may be dead for the time being, but we've seen oil drilling pop up as a last minute issue, so it will be interesting to watch that debate. It seems as if the drive to reduce regulation and streamline governmental operations this session has lost its momentum. One wonders if the overriding pressure from the state budget is causing this low number of bills to pass this session. In any event, FHCA will continue tracking those health care bills on which we've been reporting in these last nine weeks, as well as keeping an eye on whatever outcome results as the clock ticks away on lawmakers' timetable to pass a budget in the final days. As we reach the last 10 days of the 2009 session (we hope!) we are seeing the creation of some health care trains, a concept that has been somewhat obsolete for a few years but is now coming back. This typically happens when bills are stuck in committees and legislators, worried they will run out of time before the end of the session, will add on an amendment to a bill that appears to be moving through the process. On Monday, Rep. Homan's bill, HB 7131, which deals with medical encounter data, was amended to include the text from HB 651 by Rep. Hudson, which is the Agency for Health Care Administration's deregulation bill, and SB 1986 by Senator Gaetz, which is the Medicaid fraud bill. There is no Senate companion to HB 7131, which is a requirement for a bill to be passed, so we'll be watching the bill carefully to see how things will progress. The nursing home therapeutic formulary bill, SB 1868, will be debated on the Senate floor on Thursday. FHCA is continuing its communication with all Senators to help them understand how important this issue is to long term care providers. FHCA also continues to work on an amendment to ensure that nursing home residents have access to voting at the polls. As we mentioned previously, an elections bill has, in fact, been passed by the Senate, SB 956, and by the House, HB 7149, but will need much work if it is going to pass the full bodies on the floor. On Monday, FHCA attended a press conference during which numerous nonpartisan public interest organizations called upon Florida Speaker of the House Larry Cretul and Senate President Jeff Atwater to prevent two election bills from reaching the floor of the state legislature’s chambers. The groups stated the legislation (SB 956/HB 7149) passed despite the lack of opportunity for public input and also objected to the bills’ content. Among the public interest groups calling for defeat of the bill during Monday’s press conference were the League of Women Voters, AARP, AFL-CIO, NAACP, Advocacy Center for Persons with Disabilities and Miami-Dade Election Reform Coalition. Joining them were more than a dozen Democratic legislators who cited a critical New York Times editorial titled "Suppressing the Vote in Florida." FHCA is particularly concerned about the proposed changes to Florida’s voting and elections laws outlined in SB 956, which further limits acceptable IDs for voter registration and identification at the polls. Retirement center identification would no longer be valid with this bill, which is likely to disenfranchise many elderly voters, including those in nursing homes, who no longer have a driver’s license. Additionally, the bill eliminates the only free forms of ID that are currently valid and proposes no acceptable alternatives. Several FHCA member nursing homes currently serve as election polling places, and the limitations that SB 956 imposes on acceptable IDs would prohibit facility residents from the ability to exercise their right to vote in person. On Thursday, the House and Senate passed their respective budgets, setting up conference negotiations to begin on Monday. The nursing home budget language remains unchanged, with a 3 percent rate reduction in the Senate ($81 million) and a 2.5 percent rate reduction in the House ($69 million). The House version contains language that continues to prohibit the Agency for Health Care Administration (AHCA) from citing facilities for failure to comply with the 2.9 CNA staffing level as long as the facility remains above the 2.6 CNA staffing level through June 2010. The staffing issue generated some debate on the House floor, as Reps. Ocscar Braynon (D-109) and Yolly Roberson (D-104) discussed how the 2.9 staffing has greatly improved care in Florida nursing homes. Chairman Kevin Ambler (R-47) responded that nursing homes funding is being cut because providers were able to buy back previous rate cuts from January 1, 2008 and January 1, 2009 with the Quality Assessment Program that passed during the special session earlier this year. To help ameliorate the current funding cut proposed, he stated, the House extended the 2.6 staffing for another year. He argued that between a recent AHCA staffing report showing quality of care was very good under the 2.6 staffing and the flexibility this gives nursing homes, the extended staffing moratorium should not have any impact on quality of care. Reps. Braynon and Roberson pressed Chairman Ambler that, if the money could be found for nursing homes, the 2.9 staffing should be restored. Ambler responded that if any additional money is put into the health care line item during the budget conference, the restoration of nursing home funding and the staffing level will be his first priority. Rep. Braynon offered an amendment that, if the tobacco tax passed through the legislature, then the 2.9 CNA staffing level for nursing homes is restored. Unfortunately, the amendment did not directly link any revenues from tobacco money to a nursing home rate restoration, so after a positive discussion with Chairman Ambler on the House floor, he withdrew his amendment. FHCA's position continues to be one of supporting the higher staffing ratio of 2.9 CNA hours if the legislature provides the appropriate funding. We believe that funding and staffing must be aligned. In the meantime, we will continue monitoring the budget process once the conference begins on Monday and keep urging legislators to reconsider these funding cuts to nursing home care for our most frail elders. As week seven of the 2009 legislative nears a close, a lot has happened. After a stormy beginning, the sun emerged in Tallahassee, which was wonderful for the 50+ FHCA members in town for our last Lobby Wednesday. We welcomed members from Opis Management and Clear Choice Health Care, as well as several of FHCA's Florida Leaders, who joined us for an early morning at the FHCA headquarters in anticipation of a busy day ahead. It was a good day to be at the Capitol, as there were several health care committees meeting. Most relevant was the discussion on SB 1868, which creates a formulary for nursing homes similar to that in place for hospitals. This is an important issue for FHCA, and during the meeting Dr. Kaplan, a medical director who currently works for Opis, testified in support of the bill. He asked all the long term care providers in the room to stand, and it was an impressive sight. Be sure to check out this week's Provider Program online video update to see more. HB 1209 and SB 2284, which will give nurses in Florida the opportunity to voluntarily contribute toward the Florida Center for Nursing, are moving in both the House and Senate. The Agency for Health Care Administration has been working to keep its deregulation bills, HB 651 and its companion, SB 2286, moving in both chambers. In fact, these bills appear to be this year's health care train as there are many other provisions being added on in the form of amendments. These bills contain several deregulation provisions for nursing homes, and we will be pleased to see the final version signed by the Governor. The Senate Judiciary Committee passed a version of the workers' compensation bill (SB 2072); however, it does not match the version passed by the full House (HB 903), so these differences will have to be resolved before it can go to the Governor for signature. SB 2004 also passed through the Senate Criminal Justice Committee this week. This is the red-light bill, sponsored by Sen. Thad Altman (R-24), which uses a portion of the motorist fines to go toward creating an add-on for qualified nursing homes serving residents with brain and spinal-cord injuries. FHCA is continuing to monitor the budget which, after today, will head to conference for resolution. Hopefully agreement between both chambers will be reached so the session can end on time. As FHCA staff headed back to the office after a day at the Capitol, the dark clouds began swirling around us. A tornado warning has been issued for the City of Tallahassee, which resulted in us picking up our pace and thankfully making it inside before the rain and hail arrived. Things were a bit stormy inside the Capitol, as well, as the amendments started flying for a health care bill we've been tracking. HB 651, sponsored by Rep. Matt Hudson (R-101), is the Agency for Health Care Administration's bill which contains several "deregulation" provisions. It appears to be the perfect "health care vehicle" to move its way through session, and while some of the amendments stayed and some did not, in the end it is still a bill supported by FHCA. The next stop the bill will make is the House floor, so there appears to be a silver lining on the horizon. The Senate companion, SB 2286 sponsored by Sen. Andy Gardiner (R-9), is currently in the Senate Judiciary Committee. Most of the House Health Care Services Appropriations Committee was taken up by HB 433, sponsored by Rep. Ken Roberson (R-71). FHCA supports this bill, which implements a "formulary" for nursing homes similar to the one that has been in use by hospitals for nearly 25 years. The debate primarily centered around whether the physician was notified prior to the dispensing of the substituted drug (what we have now) or simply notified (the way a formulary system works). A hand-written amendment, filed during the committee meeting by Rep. "Doc" Renuart (R-18), added the "prior to dispensing" language, which is not in the companion Senate bill (SB 1868) also set to be heard later this week. This issue is far from over. For FHCA, it will be a busy week as we welcome our members to town for our last Lobby Wednesday. The House and Senate, for their part, will spend lots of time in Session, and anything can happen when legislators are on the floor. FHCA will continue tracking these bills, as well as our important reimbursement issue, and will continue keeping members up-to-date as things progress. The halls of the Capitol are quiet today as House and Senate members left Tallahassee late yesterday for the Easter and Passover holidays. Many were concerned about possible flooding along I-10, however that did not stop lengthy budget meetings that went late into the evening. In the end, budget bills were positioned for a floor debate next week. Next week is back to "business as usual," as policy committees will meet to move several important regulatory bills. Included is HB 651 by Rep. Matt Hudson (R-101), and the companion, SB 2286 by Senator Andy Gardiner (R-9), which are the deregulation bills put forth by the Agency for Health Care Administration. In addition, FHCA staff and lobbyists continue to work on other priorities of the Legislative Committee, including reimbursement, resident voting, ombudsman issues, duplicative inspections and reports and guardianship fees. FHCA's last Lobby Wednesday will be on April 15th, and a large crowd is expected. Participation at these events has far exceeded last year's numbers, and FHCA appreciates everyone who takes the time to come to Tallahassee and help advocate for our critical long term care issues. The House Appropriations Council on General Government and Health Care approved its half of the state's budget today, which includes health care funding. During the meeting, Rep. Carl Domino (R-83) stated that the Healthy Seniors budget contains only minor cuts in programs for seniors. Rep. Jimmy Patronis (R-6) reported that the Medicaid budget is $18.1 billion, with $3.5 billion coming from the state's general revenue fund. The federal stimulus money allowed the state to reduce its funding by 19.1 percent. The budget included no cut in rates for hospitals or most Medicaid providers. Rep. Kevin Ambler (R-47) stated that nursing homes have a 2.5 percent cut due to an increase in the Nursing Home Diversion Program. In discussing the Budget Implementing bill, Rep. Oscar Braynon (D-103) offered an amendment to strike language which extends the moratorium for another year on nursing home staffing above 2.6 CNA hours. He, as well as Rep. Yolly Roberson (D-104), called for higher staffing and the funds to pay for it. Rep. Ambler provided an extensive defense of the 2.6 hour staffing, including findings from a recently released Agency for Health Care Administration report, as well as the current budget situation. Rep. Braynon withdrew the amendment and asked that everyone continue to look at this issue. In the end, the Council approved both the budget and the budget implementing bill along party lines. FHCA will continue to monitor the proposed cuts to nursing homes, urging legislators of the negative effect these cuts would have on nursing home quality care for residents. 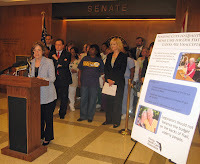 Today, as legislators considered millions in funding cuts to nursing home care, Senator Nan Rich (D-Weston) and Rep. Mark Pafford (D-West Palm Beach) joined Florida Health Care Association (FHCA) Chair Deborah Franklin, Leslie Spencer of AARP, Cloreta Morgan of SEIU and other elder care advocates to urge legislators to use federal stimulus dollars as they were intended – for health and human services – and not cut funds for nursing home care. Currently, the Senate had proposed $81 million and the House $69 million in funding cuts to the Medicaid program, while taking over $780 million of federal stimulus dollars designated for health care and redirecting them into other areas. Franklin noted during today's event that the solution for funding nursing home care passed in the January 2009 special session with the Quality Assessment Program. Providers began self-imposing a 5.5 percent assessment on April 1, 2009 to allow the state to draw down more than $390 million in federal money. This is in addition to the $4.2 billion that Florida Medicaid will receive in federal stimulus dollars over the next 27 months. Florida legislators have no reason to impose these cuts when the funding is available through the federal stimulus package. They are simply unnecessary and unacceptable and threaten to undo relief from the Quality Assessment Program, as well, which has barely begun to take affect,” Franklin said. Rich and Franklin both noted that the elder care reform (SB 1202) that passed in 2001 that required increased minimum staffing standards has resulted in dramatic improvements to nursing home quality. Florida hired over 12,000 nurses and CNA positions over the past eight years, and today has among the highest ratio of staff-to-resident care in the nation. Maintaining steady quality improvements for resident care is a goal strongly supported by elder care advocates including AARP, Florida Association of Homes and Services for the Aging, Florida Catholic Conference, Florida CHAIN and the Service Employees International Union, among others. As the last half of the 2009 legislative session begins on a humid Monday morning, all eyes are on the state budget. Many committee meetings are packed into this shortened work week (which will last only 2.5 days), and while regulatory and policy issues are important, no one can escape the ever presence of the budget. There is much concern by everyone regarding the state's use of federal stimulus dollars, decisions to cut provider rates and the growing rift between legislative members in the two chambers over just who makes the final decisions. Let it be said that this short week may be more exciting than week's past. We're jumpstarting this Monday with a press conference today at 12:15 p.m. on the 4th Floor of the Senate Rotunda to address our concerns with these provider cuts when money is available through the stimulus package. FHCA will be joined by Senator Nan Rich (D-Weston), Leslie Spencer of AARP and Cloreta Morgan of SEIU. Watch for our next update with more on this event, and the resulting discussions that surround the state budget. As Tallahassee continues to receive unending rain, our dedicated FHCA members braved the weather and made their way up to the Capitol for their legislative visits. The weather may have dampened some of the Dade Day activities, but with a captive audience in the Capitol, our members were able to see many more of their legislators. This is very important, as we are in the midst of serious budget problems and need everyone's support to help educate legislators to the extent of the problem. The proposed nursing home funding cuts - $81 million in the Senate and $69 million in the House - could threaten quality care and quality of life for our state's frail elders. These cuts are unacceptable, particularly when money is available from the federal stimulus package, yet lawmakers are moving over $780 million of stimulus dollars out of health and human services and into other areas. FHCA members, family members of residents and long term care staff are encouraged to contact their legislators and urge them to oppose these funding cuts and use the stimulus dollars as they were intended - to fund the Medicaid program. You can click here, or use the Take Action link to the right under the FHCA Online Resources section to send this important message to your legislators. The state budget is often one of the last bills to get worked out during the session, so we know there is a process ahead, With the magnitude of the funding cuts, however, we cannot afford to wait or let up on our elected officials. Next Monday, April 6th, FHCA will host a press conference with Senator Nan Rich and other elder care advocates to oppose these cuts and raise awareness about using the stimulus as it was intended. If you're in town, please stop by the 4th floor Senate Rotunda at 12:15 p.m. to show your support. In the meantime, stay tuned for more on this important issue next week.